On Thursday, October 25, 2018, the Dallas Police Department and District 10 Partnership visited Lake Highlands High School students to empower them to make the right choices and make a positive impact on their lives. The event started off with the Lake Highlands band and Officer Vaughn entertaining the crowd. District 10 Council Member Adam McGough told the students, “We’re all in this together”, he told them to make the right decisions because those decisions impact their community. Chief Hall told the students, “… anything that’s going to be great that comes out of Dallas, is going to come from you”. She spoke about being on board with Sgt. Quigg’s vision about the importance of mentoring, coaching and being involved with the youth and thanked him for his dedication. The students cheered the Chief’s closing message, “Love one another, respect one another, treat others with dignity and let’s make Dallas and the rest of this world a great place to be”. Former gang member, Lamont Levels, shared his story and brought awareness of the importance of how one’s choices can change your life for the better or worse. He also told them to choose their friends wisely, to pick friends that will bring you up, not down. The students were very receptive to his message. This event was a part of the Project Safe Neighborhood initiative that brings together many federal, state and local law enforcement, prosecutors and the community to reduce crime. Our “Coffee with Cops” event scheduled for this weekend has been postponed . After a conversation with our local McDonald’s partners, in light of this past week’s tragedy, we have agreed to reschedule. We appreciate the longstanding partnership and support with McDonald’s and all of our community partners and we look forward to hosting this event in the near future. It’s that time of the year! Come out and have coffee with us this Saturday, September 15, 2018. This is great opportunity to meet your neighborhood police officers and enjoy a free cup of coffee. Hope to see you all there. On September 5, 2018, the Dallas Police Department hosted the very first North Texas Law Enforcement Community Engagement Summit at the Briscoe Carpenter Center at Dallas Fair Park. This event featured community members, vendors, law enforcement, and criminal justice specialists all coming together to discuss and strategize best practices in community engagement. The crowd also heard from Houston Police Chief Art Acevado. He said, “Our job is to build trust, life is about relationships and the way we connect with people.” After the featured speakers, breakout sessions were held in different rooms at the Briscoe Center covering various engagement strategies from messaging and communication to UNIDOS, a Latino Community Outreach Program designed to provide assistance to the Spanish-speaking residents. Also, a panel discussion took place including a question and answer period. “If we don’t get to the root of the problem, all we do is treat the symptoms and for many years we’ve treated the symptoms of crime and failed to engage our community to the level they needed,” said Chief U. RENEÉ HALL as she gave the closing remarks. The North Texas Law Enforcement Community Engagement Summit featured presenters and attendees from Dallas, Plano, Grand Prairie, Bedford and other cities in the North Texas community. Throughout the event, there were faces of intrigue and enlightenment. Hopefully with law enforcement and community coming together to discuss strategies, community engagement will thrive throughout north Texas. Early this afternoon a group of Sergeants teamed up to provided cold bottled water and informative flyers to the homeless. The flyers contained information to raise awareness of heat related injuries among the homeless and citizens who spend a large amount of time outdoors. Currently, there are approximately 1,098 homeless individuals living in the City of Dallas. 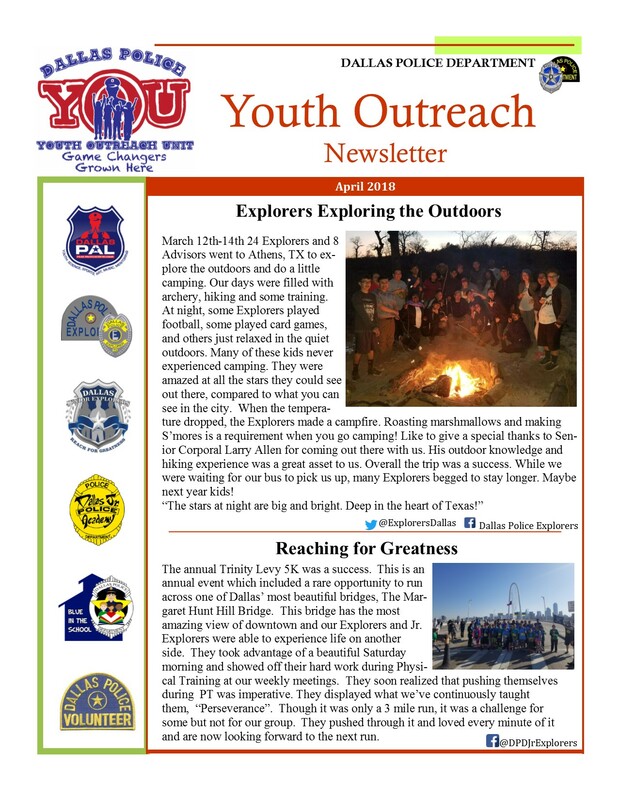 In order to address concerns from the community, members of the Southeast Patrol Division started its summer crime initiative by targeting specifics areas in southeast Dallas that has shown an increase in offenses. From June 4 through August 6, 2018, this operation will utilize various Departmental resources to prevent and deter the commission of violent offenses, with an emphasis on reducing murders, non-family violence aggravated assaults, individual and business robberies, as well as deterring narcotics activity and gang violence within the specified area below. For the duration of this initiative, the community will see an increased officer presence in the targeted area, with increased enforcement action when applicable. The effectiveness of this operational plan will be measured by the resulting decrease in the number of violent offenses committed. A daily review will be used to determine the efficiency of the resources and/or need for change in tactics. Below is the enforcement activity for the week of June 4th to June 12th. Today, Dallas PD and the World Affairs Council of Dallas Fort Worth hosted a group of 15 law enforcement officials from Mexico for a Police Professionalization Exchange Program exploring Community Policing. The group was accompanied by 2 interpreters, 2 representatives of The Police Foundation, and 1 representative of Global Ties U.S., the coordinating organization. During the presentation, Deputy Chief Rick Watson and Sergeant Robert Muñoz informed the Mexican officials of how Dallas PD implements community policing, specific initiatives, and how our philosophy affects all aspects of policing. Sergeant Muñoz, who oversees the Office of Community Affairs, reached out to the Neighborhood Police Officers (NPOs) and invited them to speak during the presentation. Each speaker shared their perspective of what each unit does in efforts to bridge the gap between the community and police. The keyword during the presentation was “trust”, police agencies have to gain the communities trust in order to maintain a healthy and growing relationship. Dallas PD continues to actively listen to what the community wants and strives to provide them with excellent customer service. Dallas PD was beyond grateful to have been given the opportunity to share what we do within our department with other agencies that are willing to positively grow with their own communities. Law enforcement in Mexico has the significant challenge of continuing to combat large criminal organizations that are ever evolving and constantly adapting with new technologies and seemingly unlimited resources. Within this context, law enforcement officers are being asked to take on many responsibilities including tracking these organized criminal enterprises; building strong cases against them; serving as witnesses in court cases; engaging with the communities to root out criminal organizations and keep the public safe. However, low salaries, poor working conditions, and limited opportunities for career advancement may hinder law enforcement agencies’ abilities to recruit and/or retain high quality, professional police forces and officers. With these challenges in mind, Global Ties U.S. has developed the Police Professionalization Exchange Program (PPEP) to provide substantive and concrete opportunities for Mexican law enforcement professionals to begin to obtain some of the training they need to increase their leadership and tactical skills. Our program is designed to do this through hands-on training, academic learning, and direct engagement with law enforcement personnel and agencies in the United States, which will provide practical skills and examples, as well as needed training and academic hours. Funded by the U.S. Department of State Bureau of International Narcotics and Law Enforcement Affairs (INL) through the U.S. Embassy in Mexico, the Police Professionalization Exchange Program is designed to provide training and professional development to 3,900 Mexican police officials from 2017-2019. The program will provide participants with direct exposure and access to U.S. police professionals and experts. Participants will receive training and professional development via online lectures, training academies, professional study tours in the U.S. and participation in a Mexico-based training institute facilitated by U.S. law enforcement experts and professionals. On Saturday April 7, 2018, the K-9 and Central Patrol Division hosted it’s very own ”Chief on the Beat” Health and Safety Fair. However, this one had a twist. This edition included your doggies as special guests. People lined the front entrance to get free rabies vaccinations for their pups. On the inside there was live music, line dancing, and health care providers introducing and providing services all for free for those in attendance. Please enjoy the posted photos from this weekend’s event. 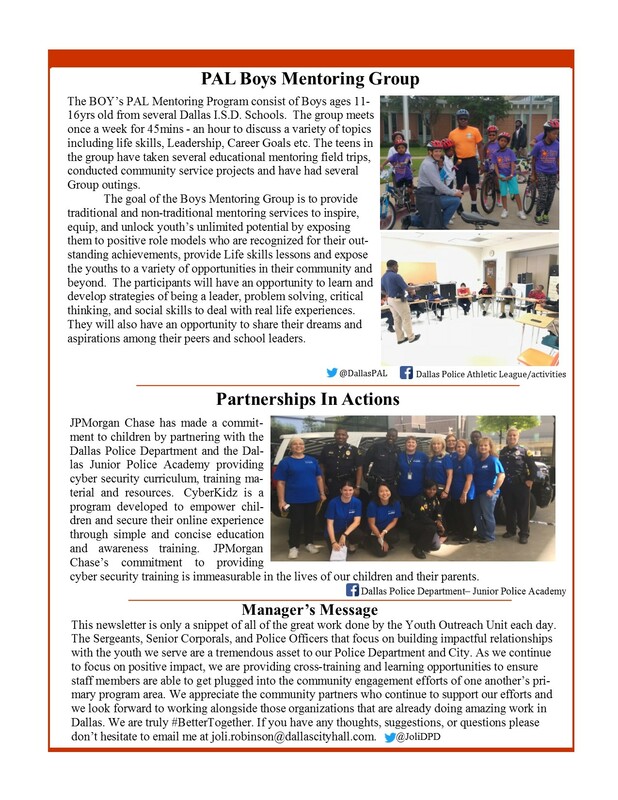 “Chief on the Beat” is one of the most successful community engagement events for the Dallas Police Department. If you would like to attend our next event please follow us @DallasPD on Twitter for future “Chief on the Beat” information.